Thomas v. Lennox Industries Inc.
Why was the Notice issued? How do I know whether I am part of the Settlement? How do I know if I am a Settlement Class Member? Are there exceptions to being included? What if I am still not sure whether I am part of the Settlement? How do I know if I am eligible for Settlement benefits? What benefits am I eligible for under the Expanded Warranty and Reimbursement Program? Tell me more about the Replacement Coil Warranty? Does the Settlement provide any other benefits? How do I get benefits? What if I purchased a newly built home and do not have proof of the purchase date or installation date of the Original Coil? What if I am the subsequent purchaser of the Original Coil? When would I get the Settlement benefits? I am an Authorized Claimant, how do I redeem and obtain the Settlement benefits? What rights am I giving up to get benefits and stay in the Settlement Class? What are the Released Claims? If I exclude myself, can I still get benefits from this Settlement? If I do not exclude myself, can I sue Lennox for the same claims later? What is the difference between objecting to the Settlement and asking to be excluded from it? When and where will the Court decide to approve the Settlement? 1. Why was the Notice issued? A federal Court authorized the Notice because you have a right to know about the proposed Settlement of this class action lawsuit and about all of your options before the Court decides whether to grant final approval of the Settlement. The Notice explains the lawsuit, the Settlement, your legal rights, what benefits are available, and who can get them. Judge Sara L. Ellis of the United States District Court for the Northern District of Illinois, Eastern Division, is overseeing this class action. The case is known as Thomas v. Lennox Industries Inc., Case No. 1:13-cv-07747. The people who filed this lawsuit are called the "Plaintiffs" and the company they sued, Lennox, is called the "Defendant." The Plaintiffs claim that Lennox manufactures and sells air conditioning systems and heat pump systems, including air handlers and Packaged Units, containing defective evaporator coils that corrode and leak refrigerant. They claim that the evaporator coils, which are made using copper tubing, are susceptible to formicary corrosion (caused by a chemical reaction requiring certain volatile organic compounds, water, heat, and the copper tubes) that causes microscopic tunnels to form within the tubing and the coils to leak refrigerant. Should have replaced the defective evaporator coils rather than the refrigerant in the unit when the coils leaked. Lennox denies all of the claims and allegations made in the lawsuit and denies that it acted improperly. In a class action, one or more people called Plaintiffs or Class Representatives (in this case, Robert Thomas, Scott Patrick Harris, Michael Bell, Sandra Palumbo, Frank Karbarz, and Thomas Davis) sue on behalf of other people who have similar claims. The people included in the class action are called a Class or Class Members. One court resolves the issues for all Class Members, except for those who exclude themselves from the Class. The Court did not decide in favor of the Plaintiffs or Lennox. Instead, both sides agreed to a Settlement. This way, they avoid the cost and burden of further litigation and a trial and the people affected can get benefits. The Class Representatives and their attorneys think the Settlement is best for all Settlement Class Members. 5. How do I know whether I am part of the Settlement? 6. How do I know if I am a Settlement Class Member? To confirm that you are a Settlement Class Member you may want to review the manufacturer's limited warranty or manufacturer's extended limited warranty that was provided by Lennox or Allied Air Enterprises LLC when you purchased the air conditioning or heat pump system to confirm that the coil was covered by the Original Warranty. You may also want to look at your purchase or installation receipt to confirm that your Original Coil was purchased between October 29, 2007 and July 9, 2015 and is one of the following brands listed in FAQ 5 (Lennox, Aire-Flo, Armstrong Air, AirEase, Concord, or Ducane). 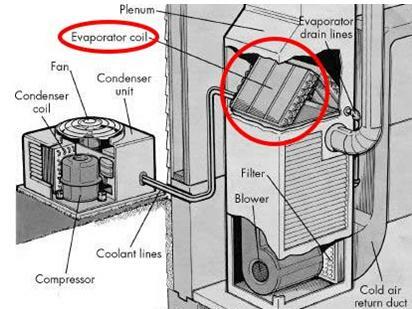 The picture below illustrates where the evaporator coil typically is located, although configurations vary depending on the structure and location of your home and where the air conditioning or heat pump system is placed inside your home. 7. Are there exceptions to being included? The government of, and each department of the United States, the District of Columbia, each of the 50 States, each county, city, municipality and town within each of the 50 States, and each other political subdivision of the United States, the District of Columbia, and each of the 50 States. The Settlement Class does not include subsequent purchasers. To be a member of the Settlement Class, a claimant must have purchased at least one new eligible evaporator coil. Purchasers of newly built homes with new evaporator coils already installed are eligible. 8. What if I am still not sure whether I am part of the Settlement? If you are not sure whether you are included, call 1-888-841-1363, send an email to admin@evaporatorcoillawsuit.com, or write to one of the lawyers listed in FAQ 24 below. 9. What does the Settlement provide? Up to $550 as reimbursement for labor and refrigerant charges for each uncoated copper tube coil replacement after the first replacement. Expanded Warranty and Reimbursement Program benefits require replacement of an Original Coil due to a coil leak within five years after installation and will vary by individual Settlement Class Members. 10. How do I know if I am eligible for Settlement benefits? All Settlement Class Members are eligible for coverage under an Expanded Warranty and Reimbursement Program. To receive any benefits the Settlement Class Member must be an Authorized Claimant, which means they have submitted a timely and valid Claim Form. The deadlines for submission of Claim Forms vary by circumstance, and are explained below. Each Authorized Claimant will receive a certificate (the "Certificate") describing the benefits under the Expanded Warranty and Reimbursement Program and providing instructions about when and how to redeem and obtain such benefits. 11. What benefits am I eligible for under the Expanded Warranty and Reimbursement Program? $75 Service Rebate. If you replace or have previously replaced your Original Coil due to a coil leak within five years of installation of the Original Coil, you can receive a one-time $75 Service Rebate for service, including routine maintenance, performed after the date the rebate is issued on the Replacement Coil (the evaporator coil that was installed to replace your Original Coil) or on any Lennox brand, Aire-Flo brand, Armstrong Air brand, AirEase brand, Concord brand, or Ducane brand HVAC products installed in the same residence as the Replacement Coil. Timely and valid submission of proof of replacement of your Original Coil is required before the Service Rebate Certificate will be issued. The Service Rebate will be available for one year from the date the Rebate Certificate is issued. Service must be provided by an independent dealer listed here. To redeem this rebate once it has been issued, you must provide proof of service and the date the service was received within 60 days of the date the service was performed. On timely receipt of valid proof of service, Lennox will send the Claimant a check for $75. First Coil Replacement. You will be eligible to receive a Replacement Coil at no charge for the Replacement Coil itself as part of the Original Warranty ("First Replacement Coil"). If the First Replacement Coil is installed more than one year but equal to or less than five years after the Original Coil was installed, you may also become eligible for retroactive reimbursement for labor and refrigerant for installation of that First Replacement Coil if that First Replacement Coil is later replaced (see Retroactive Reimbursement for First Coil Replacement below). Additional Coverage for Replacement Coil. If you received or receive an uncoated copper tube evaporator coil as the First Replacement Coil, you will be eligible for a five-year part and labor warranty on that coil (the "Replacement Coil Warranty"). This Replacement Coil Warranty is in addition to, and may provide coverage for a longer period of time than, your Original Warranty. To be covered by the Replacement Coil Warranty, you must submit a timely and valid Claim Form and you must follow the instructions in the Certificate that will be sent to you. Replacement Coil Leak. If the Replacement Coil that is covered by the Replacement Coil Warranty leaks and requires replacement within the five-year Replacement Coil Warranty period, you will be eligible to receive a coated copper or aluminum tube Replacement Coil (as determined by Lennox) at no charge for the Second Replacement Coil itself and up to $550 as reimbursement for the costs of labor and refrigerant to install the Second Replacement Coil. You must notify Lennox as specified in the Certificate to arrange for provision of the coated copper or aluminum tube Replacement Coil. Installation must be performed by an independent dealer listed here. Reimbursement will be made only if you provide an itemized invoice or receipt, and proof of payment, or other evidence showing the amount charged and the amount paid for labor and refrigerant. To receive reimbursement, proof of payment must be submitted online or postmarked no later than 60 days after the installation of the coated copper or aluminum tube Replacement Coil. You may also be eligible for retroactive reimbursement for installation of the First Replacement Coil (see Retroactive Reimbursement for First Coil Replacement below). First Coil Replacement. If you replaced the Original Coil for the first time more than one year but equal to or less than five years after the Original Coil was installed, you may be or become eligible for retroactive reimbursement for labor and refrigerant for installation of that First Replacement Coil if that First Replacement Coil was or is replaced (see Retroactive Reimbursement for First Coil Replacement below). Subsequent Coil Replacements. If you replaced a Replacement Coil once or more than once, you will be eligible to receive up to $550 as reimbursement for the costs of labor and refrigerant incurred for each replacement of an uncoated copper tube Replacement Coil that occurred after installation of the First Replacement Coil and on or before July 9, 2015. To be reimbursed, you must submit a timely and valid Claim Form that includes an itemized invoice or receipt, and proof of payment, or other evidence showing the amount charged and the amount paid for labor and refrigerant. Additional Coverage for Most Recent Replacement Coil. If you replaced an Original Coil or a Replacement Coil with an uncoated copper tube Replacement Coil on or before July 9, 2015, you will be eligible for the five-year Replacement Coil Warranty on the most recent Replacement Coil. The Replacement Coil Warranty is retroactive and covers the previously installed Replacement Coil for five years from the date it was installed. To be covered by the Replacement Coil Warranty, you must submit a timely and valid Claim Form and follow the instructions in the Certificate that will be sent to you. Replacement Coil Leak after July 9, 2015. If the Replacement Coil that is covered by the Replacement Coil Warranty leaks and requires replacement after July 9, 2015 and within the five-year Replacement Coil Warranty period, you will be eligible to receive a coated copper or aluminum tube Replacement Coil (as determined by Lennox) at no charge for the Replacement Coil itself and up to $550 as reimbursement for the costs of labor and refrigerant to install the coated copper or aluminum tube Replacement Coil. You must notify Lennox as specified in the Certificate to arrange for provision of the coated copper or aluminum tube Replacement Coil. Installation must be performed by an independent dealer listed here. Reimbursement will be made only if you provide an itemized invoice or receipt, and proof of payment, or other evidence showing the amount charged and the amount paid for labor and refrigerant. To receive reimbursement, proof of payment must be submitted online or postmarked no later than 60 days after the installation of the coated copper or aluminum tube Replacement Coil. You may also be eligible for retroactive reimbursement for installation of the First Replacement Coil (see Retroactive Reimbursement for First Coil Replacement below). Retroactive Reimbursement for First Coil Replacement. If you replaced the Original Coil for the first time over a year after the date the Original Coil was installed and received an uncoated copper tube Replacement Coil that is later replaced, you will be eligible for reimbursement up to $550 for the costs of labor and refrigerant for the replacement of the Original Coil. Reimbursement will only be made if you provide an itemized invoice or receipt, and proof of payment, or other evidence showing the amount charged and the amount paid for labor and refrigerant to replace the Original Coil. If the second coil replacement occurs after the Settlement becomes final, the second replacement must be made under the Replacement Coil Warranty for you to be eligible for this retroactive reimbursement for installation of your First Replacement Coil. 12. Tell me more about the Replacement Coil Warranty? The Replacement Coil Warranty will be in effect for five years after the date of installation of the Replacement Coil covered by the Replacement Coil Warranty, or until you receive a coated copper or aluminum tube Replacement Coil, whichever occurs first. Although the five-year Replacement Coil Warranty may be retroactive to a previous installation date, in order to be covered by the Replacement Coil Warranty you must submit a timely and valid Claim Form and you must follow the instructions in the Certificate that will be sent to you. The Replacement Coil Warranty only applies to the covered Replacement Coil. It is not transferrable to other coils or other air conditioning or heat pump systems. You are not eligible for the Replacement Coil Warranty if you receive a coated copper or aluminum tube Replacement Coil. 13. Does the Settlement provide any other benefits? Yes, Lennox has also agreed to prepare and disseminate information about the possible risk that formicary corrosion may occur in uncoated copper tube evaporator coils under certain conditions. 14. How do I get benefits? You must complete and submit a valid Claim Form by the applicable deadline to obtain coverage under the Expanded Warranty and Reimbursement Program and to request benefits for which you may be eligible as of the date you submit your Claim Form. If your Original Coil is replaced with a Replacement Coil within five years of the date of installation and on or before December 3, 2015, then you must complete and submit a Claim Form by February 1, 2016. If your Original Coil is replaced with a Replacement Coil within five years of the date of installation and on or after December 4, 2015, then you must submit a Claim Form within 60 days after the date on which the Original Coil was replaced. Follow all of the Claim Form instructions and include the required supporting documentation. Once your Claim Form has been processed and approved, you will be sent a Certificate explaining the benefits under the Expanded Warranty and Reimbursement Program and providing instructions about when and how to redeem and obtain such benefits. To redeem and obtain benefits under the Expanded Warranty and Reimbursement Program for which you may first become eligible after submission of your Claim Form, you must complete and submit follow-up Request for Benefits Forms, as explained in the Certificate, with information and supporting documentation that were not already included in the Claim Form. 15. What if I purchased a newly built home and do not have proof of the purchase date or installation date of the Original Coil? If you purchased a newly built home and the purchase date or installation date of the Original Coil is unknown, as an alternative, Class Members may provide proof of the date of the closing on the purchase of the new home. 16. What if I am the subsequent purchaser of the Original Coil? 17. When would I get the Settlement benefits? The Court will hold a hearing at 9:30 a.m. on December 9, 2015 to decide whether to grant final approval of the Settlement. If the Court approves the Settlement, there may be appeals. It is uncertain whether appeals will be filed and, if so, how long it will take to resolve them. The Settlement will not become final until all appeals have been resolved and the time for any appeals has expired. Settlement benefits will be provided to Authorized Claimants as soon as possible, if and when the Settlement becomes final. There is one exception. If you have become an Authorized Claimant by submitting a timely and valid Claim Form, and you become eligible for a coated copper tube or aluminum tube Replacement Coil under the Expanded Warranty and Reimbursement Program before the Settlement has become final, and you notify Lennox as specified in the Certificate, Lennox will provide the Replacement Coil at that time, even though the Settlement has not become final. 18. I am an Authorized Claimant, how do I redeem and obtain the Settlement benefits? To redeem and obtain benefits under the Expanded Warranty and Reimbursement Program for which you may first become eligible after submission of your Claim Form, you must complete and submit follow-up Request for Benefits Forms, as explained in the Certificate, with information and supporting documentation that were not already included in the Claim Form. More information on when and how to submit a Claim Form and Request for Benefits Forms is provided in FAQ 14. 19. What rights am I giving up to get benefits and stay in the Settlement Class? Unless you exclude yourself, you are staying in the Settlement Class. If the Settlement is approved and becomes final, all of the Court's orders will apply to you and legally bind you. You won't be able to sue, continue to sue, or be part of any other lawsuit against Lennox and related parties about the legal issues in this case, but you will be able to submit a Claim Form to receive benefits from this Settlement. The specific rights you are giving up are called Released Claims. 20. What are the Released Claims? Generally, if and when the Settlement becomes final, Settlement Class Members will permanently release Lennox and all related people (such as retailers, distributors, and dealers) from all manner of claims (except personal injury claims) which are based upon, arise out of, or involve any matters relating to Lennox brand, Aire-Flo brand, Armstrong Air brand, AirEase brand, Concord brand, or Ducane brand evaporator coils originally purchased during the Settlement Class period or any of the allegations in this lawsuit. Definitions 41 and 42 of Section IV.B of the Settlement Agreement, describe the specific claims and parties you will be releasing, so read it carefully. If you have any questions you can talk to the law firms listed in FAQ 24 for free or you can, of course, talk to your own lawyer. 21. How do I get out of the Settlement? 22. If I exclude myself, can I still get benefits from this Settlement? No. If you exclude yourself, you are telling the Court that you don't want to be part of the Settlement Class in this Settlement. You can only get benefits if you stay in the Settlement Class and submit a timely and valid Claim Form. 23. If I do not exclude myself, can I sue Lennox for the same claims later? No. Unless you exclude yourself, you are giving up the right to sue Lennox and other Released Parties for the claims that this Settlement resolves. You must exclude yourself from this lawsuit to start or continue with your own lawsuit or be part of any other lawsuit against Lennox about the legal issues in this case. 24. Do I have a lawyer in this case? These lawyers and their firms are experienced in handling similar cases. You will not be charged for these lawyers. If you want to be represented by your own lawyer, you may hire one at your own expense. 25. How will the lawyers be paid? Class Counsel will ask the Court for up to $1,250,000 to pay for attorneys' fees, costs and expenses, which includes $2,500 service awards to each of the Class Representatives. If approved, all of these amounts, as well as the costs associated with administering the Settlement, will be paid separately by Lennox and will not reduce the amount of Settlement benefits available to Settlement Class Members. The application for an award of attorneys' fees and reimbursement of costs and expenses and for service awards will be filed with the Clerk of the United States District Court for the Northern District of Illinois, Eastern Division, Everett McKinley Dirksen United States Courthouse, 219 South Dearborn Street, Chicago, Illinois 60604 no later than November 4, 2015. This court document is available here. 26. How do I tell the Court that I do not like the Settlement? Mail your objection to the Clerk of the Court and the Settlement Administrator postmarked on or before November 11, 2015. Chicago, IL 60604 Thomas v. Lennox Industries Inc. If you object, you may be deposed by Class Counsel and Defense Counsel in the county of your residence. 27. What is the difference between objecting to the Settlement and asking to be excluded from it? Objecting is simply telling the Court that you don't like something about the Settlement. You can object only if you stay in the Settlement Class (do not exclude yourself). Excluding yourself is telling the Court that you don't want to be part of the Settlement Class. If you exclude yourself, you cannot object because the Settlement no longer affects you. 28. When and where will the Court decide to approve the Settlement? The Court will hold a Final Approval Hearing at 9:30 a.m. on Wednesday, December 9, 2015 at the United States District Court for the Northern District of Illinois, Eastern Division, Everett McKinley Dirksen United States Courthouse, 219 South Dearborn Street, Chicago, Illinois 60604. At this hearing, the Court will consider whether the Settlement is fair, reasonable, and adequate. It will also consider whether to approve Class Counsel's application for an award of attorneys' fees, costs and expenses, as well as the Class Representatives' service awards. If there are objections, the Court will consider them. Judge Sara L. Ellis will listen to people who have asked to speak at the hearing (see FAQ 30 below). After the hearing, the Court will decide whether to approve the Settlement. 29. Do I have to come to the hearing? No. Class Counsel will answer any questions Judge Sara L. Ellis may have. However, you are welcome to come to the hearing at your own expense. If you send an objection, you do not have to come to Court to talk about it. As long as you mailed your written objection on time and include the information set forth above (see FAQ 26), the Court will consider it. You may also pay your own lawyer to attend, but that is not necessary. 30. May I speak at the hearing? Yes. You may ask the Court for permission to speak at the Final Approval Hearing. To do so, you must file a written notice with the Court saying that it is your "Notice of Intent to Appear at the Final Approval Hearing in Thomas v. Lennox Industries Inc., Case No. 1:13-CV-07747 (N.D. Ill.)." You must include your full name, current mailing address, current day and evening telephone number, and your signature. If you plan to have your own attorney speak for you at the hearing, you must also include the name, address, and telephone number of the attorney who will appear. Your written notice must be mailed to the Clerk of the Court and the Settlement Administrator postmarked on or before November 11, 2015. 31. What happens if I do nothing at all? If you are a Settlement Class Member and you do nothing, you will give up the rights explained in FAQ 19, including your right to start a lawsuit, continue with a lawsuit, or be part of any other lawsuit against Lennox and the other Released Parties about the legal issues in this case. In addition, if you do not file a valid Claim Form within the applicable time periods described above you will not receive any of the benefits that this Settlement provides. 32. How do I get more information? The Notice summarizes the proposed Settlement. Complete details are provided in the Settlement Agreement. The Settlement Agreement and other related documents are available on this website. For more information, call 1-888-841-1363, write to Thomas v. Lennox Industries Inc., Settlement Administrator, P.O. Box 43374, Providence, RI 02940-3374, or send an email to admin@evaporatorcoillawsuit.com.